Learning management system (LMS) is a software application for the administration, documentation, tracking, reporting and delivery of e-learning courses or training programs. Learning Management Systems range from systems for managing training and educational records to software for distributing online and blended college courses which works as online collaboration. All the educational establishments use LMSs to deliver online courses and augment on-campus courses. LMSs also act to augment the lessons the teacher using the more traditional tools. Corporate training departments use LMSs to deliver online training, as well as to automate record-keeping and employee registration. In more technical language, LMS is the framework that handles all aspects of the learning process. It is the infrastructure that delivers and manages instructional content, identifies and assesses individual and organizational learning or training goals, tracks the progress towards meeting those goals, and collects and presents data for supervising the learning process of the organization as a whole. A Learning Management System delivers content but also handles registering for courses, course administration, skills gap analysis, tracking, and reporting. Thus, it is an one-stop solution for all educational needs. 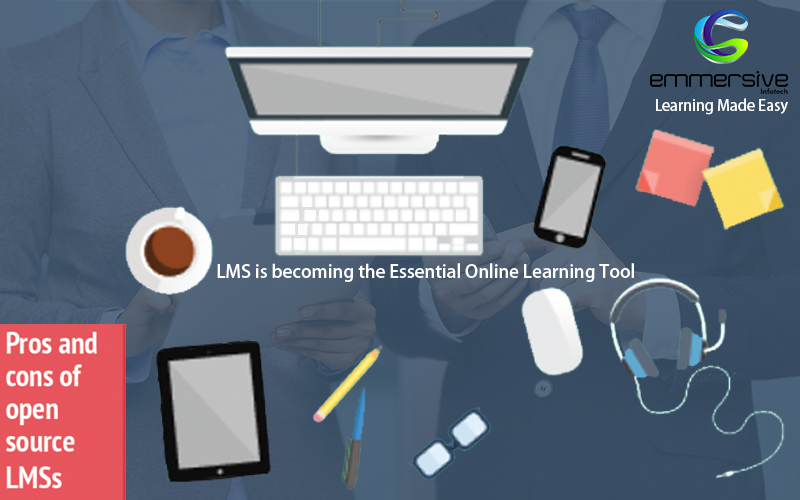 Some of the features that define Learning management system (LMS) are shared. The learning management system simplifies the learning process. The systems are easy to use and new users can figure everything out easily. The systems accommodate multiple features including recording and tracking, documentation and administration, as well as classroom learning. These systems are affordable alternatives that offer scalable and personalized platforms for learning. They deliver integrated and enriched learning experiences for the users that expound upon virtual learning and collaboration modules. The learning management system also allows users to be evaluated before they take the course, while they are in the course, and when they finish the course. This means that employers can evaluate their retention levels through periodically scheduling assignments. They can then review the records to determine the levels of success. In educational settings, students can review their personal performance based on quizzes and tests that are administered by the professors. The learning management system helps to enhance performance through tracking and reporting tools. Progress of new users can be tracked, records can be reviewed, and users can register for more than one course. Employers are able to offer the courses through web-based training, webinars, and other forms of instructor-led training. Management can then access the records of those who participated to analyze which areas need improvement. The learner can now put in additional efforts in the areas that are difficult for them, because learning management systems give users the ability to manipulate their learning pace. The learning management system offers a centralized source of learning. This means that the training, performance, and development content are offered at all times from the same source. Multiple users can access the information at any given time. These systems ensure consistency in the evaluation and delivery of the material, meaning every user sees the same content through the same manner. These systems let the user design customized training modules that can be used to introduce new equipment, update equipment, or modify operating procedures.